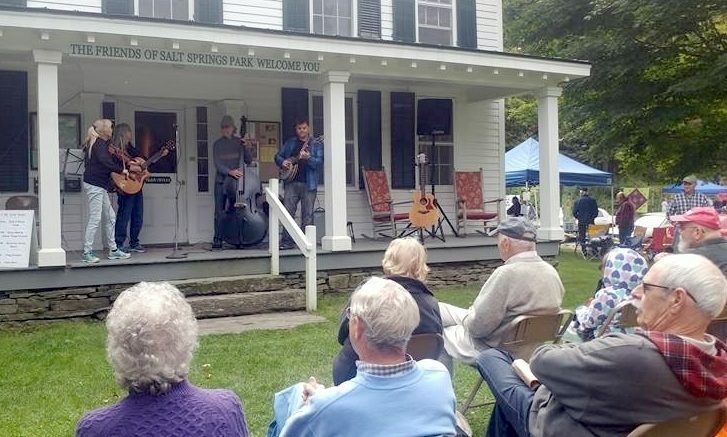 The Brackney String Band will perform once again on the porch of the Wheaton House at Salt Springs Park during the Salt Springs Celebration, Saturday, Sept. 1, at 2 p.m.
Every Saturday of Labor Day weekend the Friends of Salt Springs Park provide an afternoon of free music, activities for all ages, hikes and demonstrations, displays and exhibits, and vendors. Stop by Saturday, Sept. 1 to see what’s new in the past year, and enjoy some outdoor downtime with friends and family. It’s also the Friends annual fundraiser, so you can support the group’s work at the park by purchasing some lunch and items in our gift shop, joining in the silent auction, and becoming a member. *Binghamton ZooMobile – Zoo staff will be here from 1 to 4 pm with four to six touchable and nontouchable animals (a mix of mammals, reptiles, amphibians, and invertebrates). Stop by, view the animals up close, and ask questions. *Feathered Kisses – Lloyd and Shelley Jones provide avian rescue in South Central NY, including macaws, cockatoos, amazons, conures, and eclectus. Visitors to their Kirkwood, NY, facilities are welcome, and educational programs are available. *Food Tent Grilled sausage, chicken spiedies, veggie burgers, salads, cold and hot drinks. Be the first to comment on "What’s Happening"